I tweeted a series of pricing puzzles. This series is my interpretation of what the answers could be. Do not treat them as absolute answers. Alternative explanations are possible. Why do restaurants charge a fee for sharing? Why do they charge two different prices based on what is shared? It is safe to say that those willing to share are most likely couples and they likely pay for it from the same shared budget. For everyone else, those not sharing budgets, the question of sharing does not even come into play. A restaurant’s goal is to maximize spend per table. Their wait-staff are essentially the sales team trying to generate more sales per table during the period it was occupied. So when customers share, it cuts (almost in half) the spend (and hence profit) per table. To discourage customers from doing so, they make the price of the single entree look a little more unattractive by adding the split fee. This is second degree price discrimination. With the split fee, customers may see higher value (consumer surplus) when they order two vs. one. For those who still want to share for any number of reasons including limiting portions, even with added fee sharing will provide higher consumer surplus and the restaurant gets to recoup profit. Why charge different split fees? Price discrimination done right. If you charge one split fee, you might as well charge two. Should they do it? What about customer backlash? To repeat my earlier point, this is a limited segment that will share food. The rest won’t even notice the split fee. So by all means do it as this is money that flows straight to bottom line. However they should consider their customer mix and capacity utilization. What does this mean to you as a Tech Product Manager? I do not recommend you following in the restaurant’s footsteps. Start with the customers and their needs. Consider how your webapp is being used by your customers. From what budget are they paying for it? Is there value for them in keeping separate logins? Do they want to keep their Netflix video queue/history or Evernote clip archive separate? Do they consume your limited capacity without adding to revenue? Will Apple introduce $299 iPad? There are rumors in Tech Blogs that Apple might introduce a cheaper iPad – could be a 8GB version or a 7-inch version, priced close to $299. The argument goes, Apple does not want to yield the lower priced tablet market to Amazon. If Amazon took the risk to invest in 7-inch tablet and uncover a market for it, there is likely no risk for Apple to take its share of the market. If three to five million people bought 7-inch tablets in the last two quarters, isn’t that an opportunity for Apple? Not to mention, those who are on the sidelines, because they did not like Kindle Fire and could not afford $499 price tag may enter the market, expanding the pie. All highly likely scenarios. But there is a third scenario of similar likelihood that most ignore when making a case for introducing a new lower priced version of the product. It is those who currently buy their $499 version switching to the $299 version. Without going into the details of Second Degree Price discrimination here is a brief description. When there is no $299 version of iPad, if the $499 version offers you enough consumer surplus you will buy it. When there is a $299 version as well, you will pick that instead if it delivers more consumer surplus than the $499 version. Is the foregone profit from those trading down made up by profit from new customers we acquired? You can see their track record of past product versions (iMac versions and MacBook Air versions) we can say with high degree of certainty that Apple will ask this question. If we used the previously published numbers by iSuppli and others on cost of iPad, it costs Apple about $249 to make $499 iPad. Say their gross margin remains the same for $299 iPad (i.e., cost drops to $149). 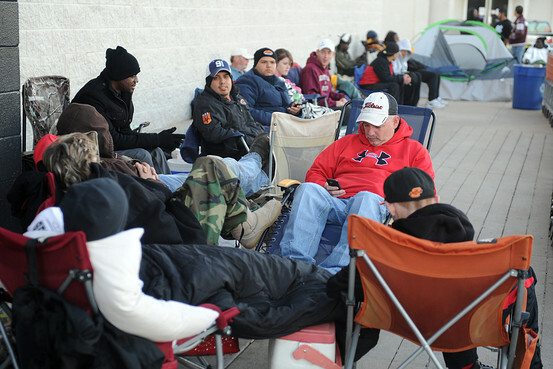 Then for every customer trading down from $499 to $299 version, Apple has to bring in 1.67 new customers. That is just to break-even the trading down customers. In addition they need to find millions more to justify their investment. Side Note 1: When you uncover a new market or spend your resources to develop a new market, it is not all yours. Others will swoop in and get their share. Side Note 2: If you run a frozen yogurt chain and want to offer a lower priced plain yogurt version, this is the question you should ask – Am I losing profit from those trading down to plain yogurt because they get better consumer surplus at its price point? I recently made a comment about a pricing article that recommends doubling prices. That's it, pricing is as simple as doubling, http://t.co/1NTxkNU keep doubling, don't stop after one time! You may think I make similar claim too. Well, am I on solid ground making a comment like this with bold claim? If one price is good, two are better. It states that if it were possible to sell a product profitably at one price, it is certain that there will be higher profit from two prices. Note that the profit here means Price less marginal cost and does not include fixed cost. You might find there are other cost components that make the second price untenable. But that is a factor you can control. Some time back I did take a critical look (to an extent I can suppress my own biases) at this claim. It is impossible for me to re-do years of economic research on consumer surplus, price discrimination and other economic works. The statement I make relies on those works first started by Pigou. The first probability statement is conditional probability. It is the equivalent of stating, “you picked a random card from the deck, if it is Jack of Spade, then we are certain that it is a face card). It states that if it were possible to sell a product profitably at one price, it is certain that there will be higher profit from two prices. Either a moment’s reflection will convince you or you need to dwell into tomes of economic research. As you can see from practice, P(1 is good) is a much small number than 1 and hence the it is not at all certain “two prices are always good”. If you find a market for your product at one price, you will find bigger market (measured in $$) at two prices. When rumors about Apple’s iCloud started appearing I was surprised that they were getting ready to give up the biggest pricing lever they have – Flash Capacity. If files were stored in the cloud and streamed to the device then does it matter whether you have a 16GB iPad or 32Gb iPad? Will customers bother to pay more just to get additional capacity? In the past I wrote at length on how Apple practices effective price discrimination with its pricing for Flash capacity in its iDevices. Here is the chart I used that shows the price curves for different iDevices. How Apple prices Flash capacity has nothing to do with what it costs them. iSuppli breakdown showed that price difference between 16GB and 32GB iPad is only $15 while the price jump is much more than that. Another noteworthy aspect of this Flash pricing is the price jump is not the same for all iDevices. As you can see from the chart, the curves get steeper as the screen size and functionality of the device increase. 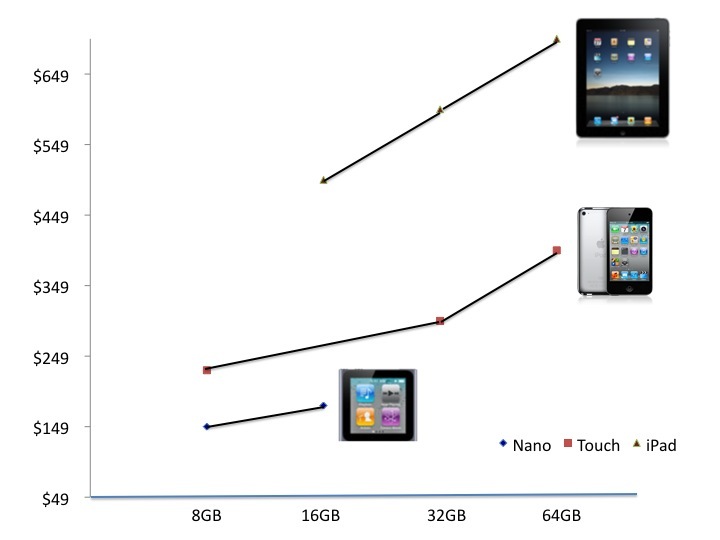 Clearly, the value from additional 16GB flash to an iPad customer is lot more than that for iPod or iPhone customer. So the same capacity is priced differently based on the value to the customer. The final and crucial piece of price discrimination puzzle is the absence of arbitrage. Apple completes its power to practice price discrimination by eliminating arbitrage (in this case alternatives). A simple way for customers to add more capacity is through extension slots but none of the iDevices provide that feature. So if we want more capacity we better be ready to pay more, lot more. Apple’s strategy, on the other hand, rests on consumers storing their content locally on their devices. Its new iCloud service allows consumers to easily sync their music collections to any of their Apple devices. Aside from the initial sync, a Web connection isn’t necessary. In other words, the need for bigger capacity on iDevices still exists. Customers cannot trade iCloud capacity and streaming to offset the higher price premium they pay for bigger flash capacity. We will continue to pay $100 for our perceived need for higher capacity. Apple will continue to capture value from commodity components. Despite the competitions and the disruptions, Apple continues to retain its pricing power – built into their product DNA is the need to maintain pricing power. What we see is an example of perfect alignment of product and pricing strategy that helps them with the real business goal – profit. Is your product strategy aligned with your pricing strategy?